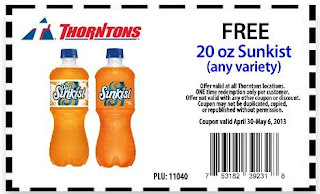 Get a free 20 oz Sunkist any variety at your nearest Thorntons store location. Click the link below to go print your coupon. Take your coupon in to your nearest store location to redeem. Valid through April 30, 2013 - May 6, 2013.